Donald O Lash, of Vicksburg passed away on Friday, April 12, 2019 at the age of 89. Don was born on November 4, 1929 in Vicksburg. He was the son of Earl and Nora (Lunger) Lash. He served his country during World War II in the United States Air Force for three years. After he returned from the service, he married the love of his life, Doris Eilene McClish. Together they raised five children: Patricia, Betty, Gerald, Ron, and Terri. Don is described as a generous, strong-willed, good and endearing man. In his spare time, he enjoyed being outdoors deer hunting, and mushroom hunting. He also loved to playing cards, and enjoyed woodworking. 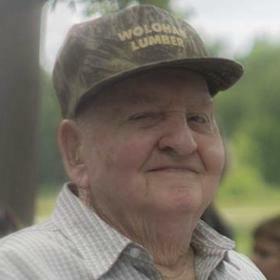 Don is survived by his wife of 69 years, Doris Eilene; five children: Patricia (Phillip) Prichard, of Centreville; Betty (Rick) Mayo, of Scotts; Gerald Lash, of Vicksburg; Ron (Pam) Lash, of Vicksburg; Terri Simmons, of Vicksburg; 13 grandchildren, 30 great grandchildren, and four great great grandchildren. He is also survived by his two sisters: Rose (Floyd) Moore, of Vicksburg and June Potter, of Vicksburg. He is preceded in death by four brothers and one sister. The family will receive friends on Monday from 4pm to 7pm at the McCowen & Secord Family Funeral Home, Rupert-Durham Chapel, 409 S. Main, Vicksburg (269-649-1697). There will also be a time of visiting one hour prior to the service at the church beginning at 10am on Tuesday. The funeral service will be held at the Chapman Memorial Church of the Nazarene on Tuesday at 11am, 7520 East U Ave, Vicksburg. Please visit Don’s webpage at www.mccowensecord.com where you can sign the guestbook and share a memory. Those who wish may make contributions to Reverence Hospice.